Watching the snow, staying indoors all day and going back and forth between the kitchen and knitting on the afghan project to keep warm. Breakfast this morning was from a batch of this wonderful crumble that Ricki posted on Diet, Dessert and Dogs recently. My first batch used Granny Smith apples and although it was good the second batch was tastier using a sweeter variety of apples. We have no coriander and I just left it out but in the second batch I substituted ground cloves – that paired nicely with the sweet potato and other spices. And since I am currently avoiding oats I filled in with some other gluten-free carbs. The resulting crumble was more volume than expected so since my choices were pre-ground maybe a little less of those carbs next time. Also I needed to use up some pecans so that went in for the walnuts. Occasionally I envy Ricki having a husband and those adorable dogs willing to share her experiments. But with this apple-sweet-potato-crumble I am happy to have it all to myself! It freezes well so nine servings can last as long as two weeks. Preheat oven to 350*F. Line a 9″ square pan with parchment, or coat with oil. In the bottom of a large bowl, whisk together the melted coconut oil, agave syrup, liquid stevia, flax seed, and almond milk; set aside. In the blender, process together (use a food processor if you have one) the nuts, cereals and coconut flour until the nuts are ground and mixture resembles a coarse meal. Add the cinnamon, ginger, cloves and salt and blend just to mix. Add the dry ingredients to the wet mixture in the bowl and toss with a fork (as if making pie dough) until it comes together in a very moist yet crumbly dough (it will stick together if pressed, but should readily separate into crumbles if tossed with the fork). Set aside while you prepare the filling. To make the filling, mix together the pureed sweet potato, grated apple, apple juice, vanilla and liquid stevia. Take about half the crumble mixture (you can just estimate) and press it firmly into the bottom of the pan. Top with the filling, spreading evenly. Sprinkle the remaining crumble mixture evenly over the filling and press gently with the palms of your hands. 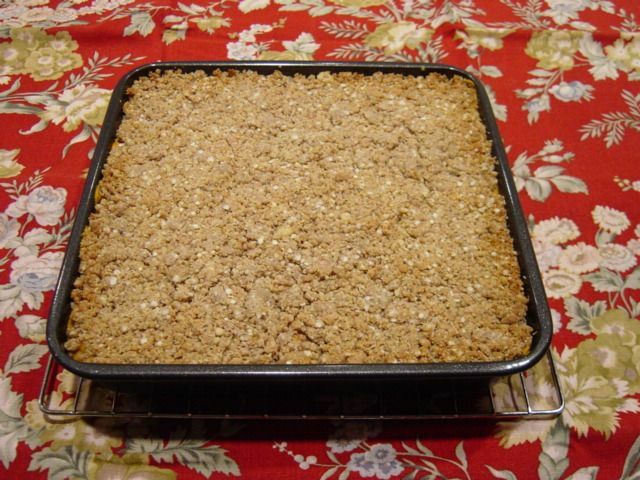 Bake in preheated oven until edges are browned and the top of the crumble begins to brown a bit. This took about 30 minutes in my oven. Allow it to cool to room temperature before cutting into squares; reheat if desired to serve. Makes 9 large servings. May be frozen. After this morning I still have six pieces in the freezer and I will, I REALLY will, save-them-for-future-breakfasts, REALLY! This is hard . . . . because I want some NOW. Mid-morning I heated up one of my own Lentil Patties, also from the freezer. So if I am eating goodies from the freezer then why am I in the kitchen? Baking not only makes the house smell good, it helps keep the house warm and also makes enough goodies to share. I baked an old-favorite, glutenful batch of pumpkin bread to give away and share with neighbors. Then I blended the dry ingredients for Double Coconut Muffins. And I did the same with a new recipe for cornbread from The Gluten-Free Vegan recipe book . The Sit ‘n Stitch ladies are coming over Thursday morning and they kindly taste test my gluten-free recipes – they are generous and helpful with their critiques and I greatly appreciate their opinions. 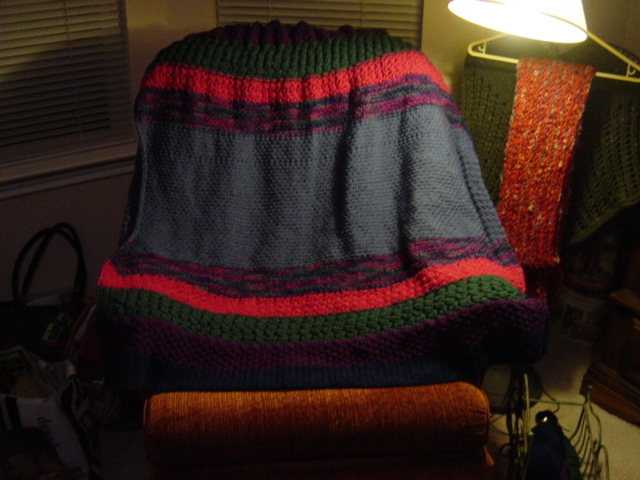 There are only a few more rows to knit on this afghan that has been under construction for maybe 18 months. We refer to these projects as Unfinished Objects or UFO’s. After Friday my calendar clears somewhat and I can begin new experiments! Yesterday was one of those days when a long-ago, best-forgotten memory was triggered. And it was also a significant anniversary date of that memory. The trigger was a comment posted here by Sharon at Art of Gluten-Free Sourdough Baking. The anniversary was the day I went into labor with my first child – that would be Rita. The memory was the kitchen disaster I perpetrated that my own Mom cleaned up the next day describing it as ‘The Bread Farm’. My paternal Grandmother, she of the chickens, home grown vegetables and homemade soap, also baked her own sourdough bread. I was allowed to ‘help’ and usually had a small portion of dough allotted to me for my own creations. Grandma was always patient and she narrated each and every step of the process for my benefit. At home I learned to bake from recipes. I used store bought yeast just as we also used store bought eggs and store bought soap never realizing the essential differences. In the morning the stove was covered with dough and was running down the front and one side. Across the top it had turned into a tenacious brick-like substance. After Rita’s Dad left for work I started the clean up. Mourning the loss of that perfectly good batch of bread I had the bright idea of salvaging it by using the remainder to start another batch. Grandma always put some of dough in a jar with additional flour and water and put it in the refrigerator until her next batch. So I carefully made up my ‘starter’ in a mason jar, screwed on the lid, and set it in the middle of the breakfast table. In the meantime I was having terrible stomach pains but that had been the story of my life (thanks to no gluten awareness at the time). I just rested across the bed between bouts of pain and in between times chiseled away at the stove. I never finished – hubby came home from work and called the doctor. We headed for the hospital. The next day my parents arrived, Rita and I were bonding, the stove was still doughy, the sink was full of utensils buried in an ever expanding yeast glob, the lid on the mason jar had come undone, and dough was spreading across the breakfast table. That was what happened the last time I attempted ‘sourdough’. While sourdough sounds like a good idea . . . . . .
‘Mad as a wet hen’ . . . if you have ever seen the expression on a wet hen after her nest of hidden eggs has been discovered and taken away from her then you forevermore treat each and every egg with respect. My paternal grandmother raised chickens and while she took very good care of them she did not allow them to hatch baby chicks during the hot Texas summer. If a hen went missing and egg production was down the search was on. When the nest was found and the eggs confiscated the hen was soaked in a bucket of water to ‘cool her off’. A cold wet hen cannot incubate eggs. Scientists may claim that animals have no ‘facial expressions’ but any person, who has observed a cat, dog, hen, or any animal will beg to differ. That steely-eyed, obviously ticked-off hen made a lasting impression. 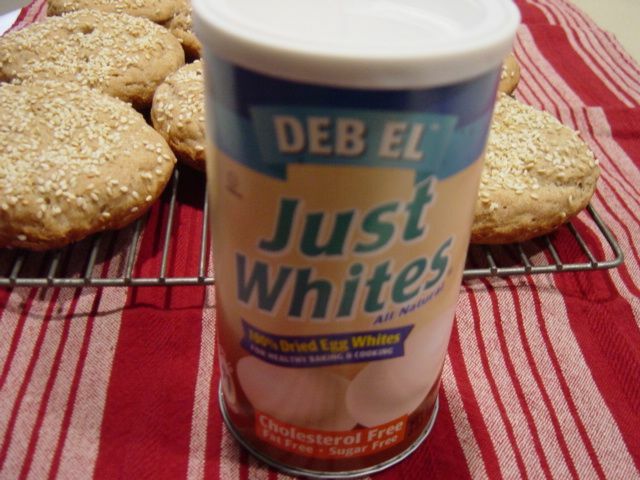 If a recipe calls for only the white of an egg and I have no use for the egg yolk then I reach in the pantry for my container of Deb El Just Whites dried egg whites. These are made from the eggs that are too small to sell fresh at the grocery store. They are dried, pasteurized, and are negative for salmonella bacteria. One technique is to simply add the powder to the dry ingredients in the recipe and add the required amount of water in with the other liquid ingredients. My approach is to dissolve the egg white powder in the water until it has the consistency associated with fresh egg white and proceed from there. I simply prefer the results having tried both techniques. Deb El needs no refrigeration and stores on a pantry shelf until you need it. If you are low on fresh eggs and have no time to run to the store the prepared amount for two whites will substitute nicely for a whole egg. You can usually find Deb El on a shelf in the baking isle at your local grocery store. I am still enjoying the results of my recent batch of Hamburger Buns that made use of Deb El reconstituted egg whites in the amount required for the three egg whites in the recipe. 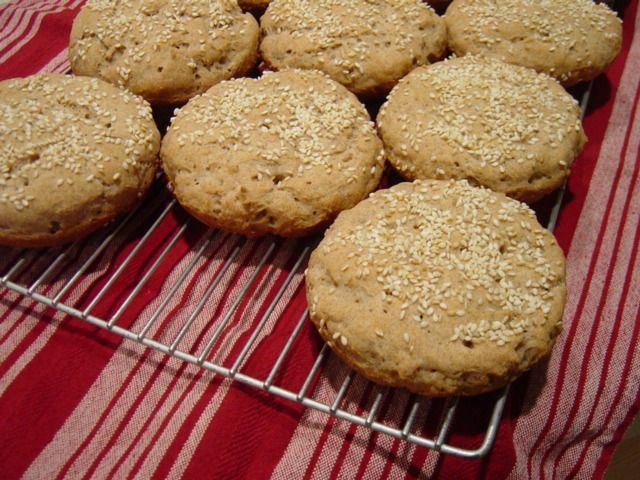 These wonderful buns were adapted from the recipe for Gluten Free Whole Grain Hamburger Buns at WHEATLESS & MEATLESS. I used tapioca flour instead of cornstarch and agave nectar instead of sugar (yeast likes pretty much anything that has calories to feed it). When I use egg whites and have no use for extra yolks then I pull out the dry egg white powder and reconstitute it. This is a great basic recipe however you tweak it! If you do not have access to great commercial gluten-free baked goods it is worth your time to have a few basic bread recipes in your file so you can stockpile your own goodies. Having some really yummy basic breads stashed in the freezer can bring a smile to your face when you need a mood lift. The first pass at making these buns was very rewarding as far as technique and the wholesomeness of the ingredients. Plus I inherited two muffin-top pans (remember those?) from my friend Lynn and put them to good use with these buns. Don cooked burgers, potato salad, and deviled eggs for dinner. Having a bun for my burger for the first time in years meant that I cut my potato portion way back but that’s OK. Bun, burger, mayo, and lettuce – that is a luxury item for us gluten-free people! The next day at lunch one of the leftover deviled eggs cut up and sandwiched in a bun was my first egg-salad sandwich in probably twenty years. Make these ahead of when you need them and when you also have the time to be patient with the yeast. Yeast can be cranky if you try to rush it. Bake these buns until they are golden. Allow them to cool completely and then wrap and use them as needed. Most of mine are stored in the freezer until the next craving overwhelms me! Oil your pan(s), dust with cornmeal (or not) and set aside. The cornmeal gives them a little bit of extra ‘finish’. Toast your sesame seeds in a small skillet on the stove top or in a glass pie plate in the microwave if you prefer them toasted like I do. Be careful, they go quickly. Whisk your sugar, water and yeast in small bowl. Mix salt, xanthan gum, flours on low in your mixing bowl. Mix the egg whites, oil and vinegar in a medium bowl. When the yeast mixture is foamy, add it to the flour mixture. Then add the egg white mix to the flour and yeast. Turn on the mixer and process the batter on medium speed for four minutes. It will most likely ‘climb’ your mixer beaters so have a spatula handy to push it back down if necessary. Scoop batter, 1/3 cup per bun, and place on or into your pans. Dip a spatula in water and use it to smooth and shape the tops of your buns. Sprinkle with sesame seeds. 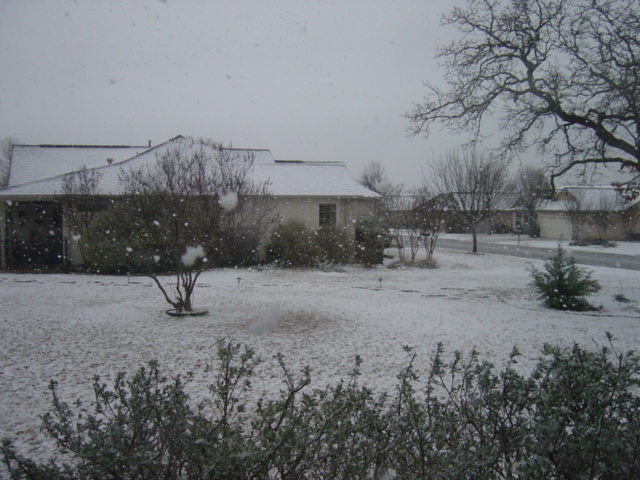 Cover and let rise to double in a safe warm place. Remove the buns briefly from the oven until you can raise the oven heat up to 350*F. Return the buns to the oven and bake for about 20- 30 minutes (all ovens bake differently). Keep an eye on them as the time gets close. They should be golden and toasty but not at all dark. Makes approximately 12 buns (these were four inches in diameter). Split them with a sharp serrated knife and pile on the fillings and spreads of your choice! Usually I prefer to eat at home for many reasons mostly because it is difficult to be confidant about eating out. After years and years of chicken salad the prospect of ‘eating out’ long ago lost any charm that it might have had. Megan and I planned to spend Friday afternoon together and our objective was to get her started on a crochet project. We had agreed on a one-skein blanket for Rusty, the family yorkie. I picked up Megan at her dormitory and at our first stop we purchased yarn and a crochet hook. We did not want to spend our precious time driving back and forth to the house so we went to the nearby Georgetown library that has amenities such as comfy chairs, work tables in quiet nooks, and a very nice in-house coffee shop, the Red Poppy Coffee Co.
We arrived at the library well after the lunch hour. I had tucked ‘emergency food’ in my purse, as usual, and was prepared to purchase coffee for myself plus whatever Megan wanted. Did that sign on the pastry display case read ‘gluten-free pizza’? I was all over that! Megan and I each ordered an individual Pesto Pita Pizza, mine to be gluten-free and hers to be regular. We found a booth and settled in with the yarn and set to work. A little later our pizzas and drinks were delivered to the table. The gluten-free pizza was square and the regular one was round and otherwise they looked exactly the same. The gluten-free crust was tender, slightly chewy, yeasty, and wonderful. The toppings were excellent quality and very tasty. About every two weeks I go to the library to pick up books. How did I ever miss the fact that the Red Poppy Coffee Co. was serving gluten-free? In my excitement over the pizza it completely escaped me that there was apple pie and a cupcake also gluten-free as Megan informed me on the way back to her dorm. And their menu advertises gluten-free bread on any sandwich! No big deal, I would have chosen the pizza regardless. It’s getting better out there. Micco recently recommended a recipe book entitled Vegan Cupcakes Take Over the World. Let’s make them gluten-free as well! Strangely enough The Gluten-Free Pantry mixes are not in my grocery store gluten-free section although all of them are gluten-free. They are displayed in the International Foods isle, perhaps because they are a product of Canada. Whatever the reason I am happy that they are there. We all need a couple of pantry staples that we can pull out and whip up something really good when we don’t have time to do the longer way. And I was motivated by the experimenting of Stephanie O’Dea at A Year of Slow Cooking and her technique for baking bread in a slow cooker. 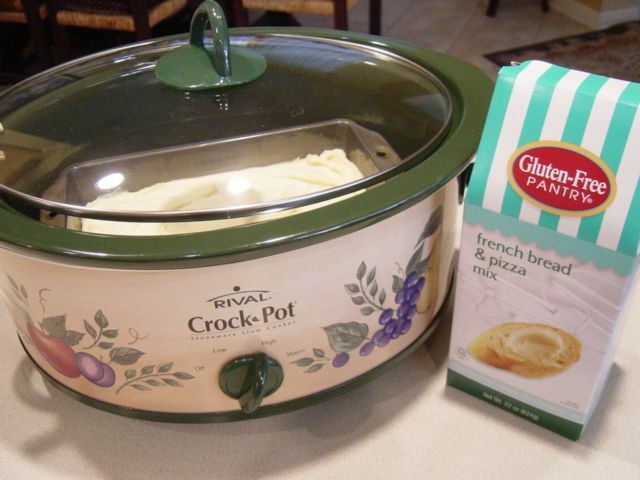 My Crock-Pot and this French Bread & Pizza Mix sat out on the kitchen counter for four days to remind me; and now the mix is mixed and the bread is baked! The first time I made bread from this mix was when I went to help Rita pack and move to Virginia in 2008. This bread was the only gluten-free baked goods that we had at her house. The taste and texture reminded me of the Pepperidge Farm bread that I bought for the kids when they were very small. It is difficult enough for a child to be sprouting teeth and learning to chew without their little peanut butter sandwich gumming up and making swallowing difficult. It was the soft white bread and not the peanut butter causing the problem. Slices of the Pepperidge Farm Very Thin White Bread made just the right size sandwich to fit a small mouth and our problem (safety issue) was solved. The Gluten-Free Pantry website announces that they are changing the look of the packaging. I hope that includes legibly printed (for all eyes) instructions. At first the dough was not coming together so I went back and re-read to see if it was my mistake. I thought perhaps the two extra large eggs would equal two eggs plus one egg white and so maybe it needed another egg. No, the dough was still thick enough to mortar bricks together. The water amount looked like 1 1/4 cups but by squinting it looked somewhat different. So I pulled out the magnifying glass and read 1 3/4 cups of water. So I dumped in another 1/3 cup of water and then it made bread dough. That tiny print on a mottled gray background could definitely be improved. This mix produces a 2-pound loaf and the directions call for a 9 inch by 5 inch bread pan. My old bread pans are quite definitely 8 inch by 4 inch so there was bread dough left over. 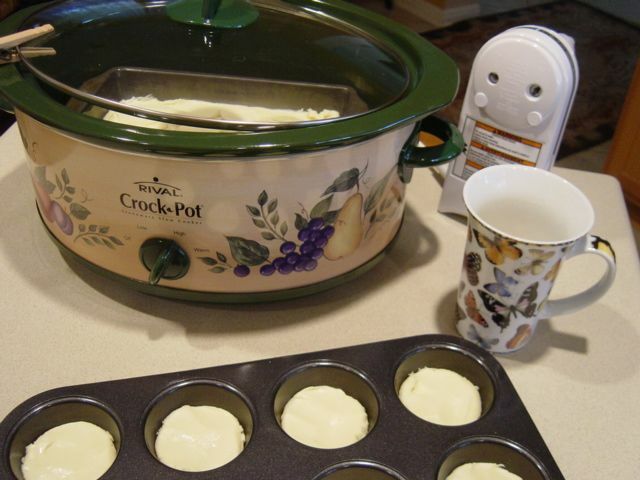 The loaf pan went into the 7-qt Crock-Pot slow cooker. The remainder of the dough was divided into a cupcake pan to make small dinner rolls. Rising took quite longer than I thought it should. Patience, patience (not my strongest suite and after all it was a cold day), and eventually there was bread! Usually I prefer to make my bread from scratch with dense nutritious flours. This mix is a great shortcut for a treat or for pulling something together when there is no time to fuss over it.